It is early morning; the sun is barely scraping its bright hues of orange and red over the horizon line of NKU’s concrete campus and everything lies still. However, beneath the sidewalks that lead students and faculty to class, there is a bustling realm of ongoing activity, a world that for the most part goes completely unseen. A labyrinth full of dimly-lit passageways, roaring freight elevators and clanking pipes snakes its way under a majority of the buildings on campus. And those tunnels funnel out to the epicenter of it all, a relatively unknown place: the underground area near the campus’ central loading dock between the library and Landrum, also known as the home to NKU’s Recycling Center. 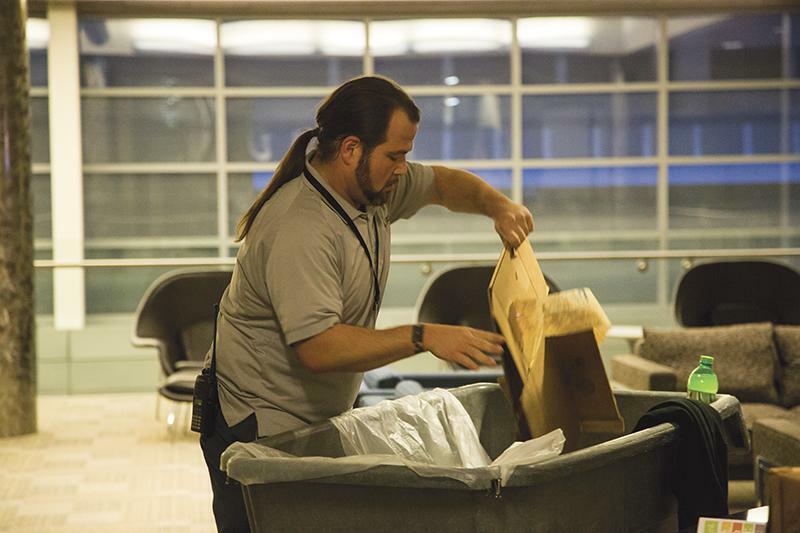 Photo by Kody Kahle | NKU Materials Handler Chris Wooldridge collects recyclables in Student Union. On any given morning, right around sunrise, you can be sure to find a plethora of people in this area, attending morning meetings, coming back to clock out from a night of work and returning from a long shift of mopping and scrubbing floors. Or, in Chris Wooldridge’s case, you would find a materials handler preparing to embark on a morning full of what many say is one of the most important acts toward environmental sustainability on campus, one that almost always goes unnoticed. This typical day that Wooldridge is describing is actually part of a routine that is not so typical at all– in the eye’s of most people on campus. Wooldridge is one of several materials handlers within NKU Recycling who hold the responsibility of collecting recyclable materials from across campus. 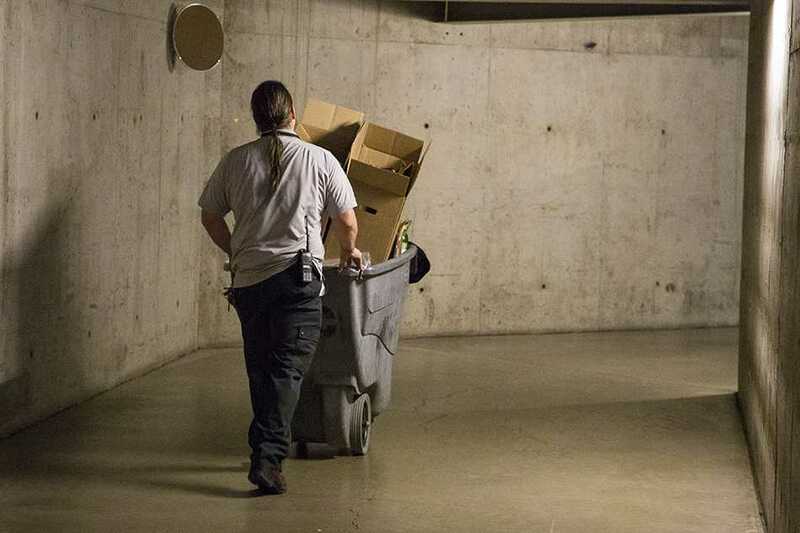 Whether it’s collecting from the countless bins speckled throughout the Student Union, to collecting confidential recyclable paper files in a locked rolling container from throughout the administrative center, Wooldridge is on the job. And this process starts on weekday mornings around 6:30 a.m., before most people in the NKU community even think about stepping foot onto campus. 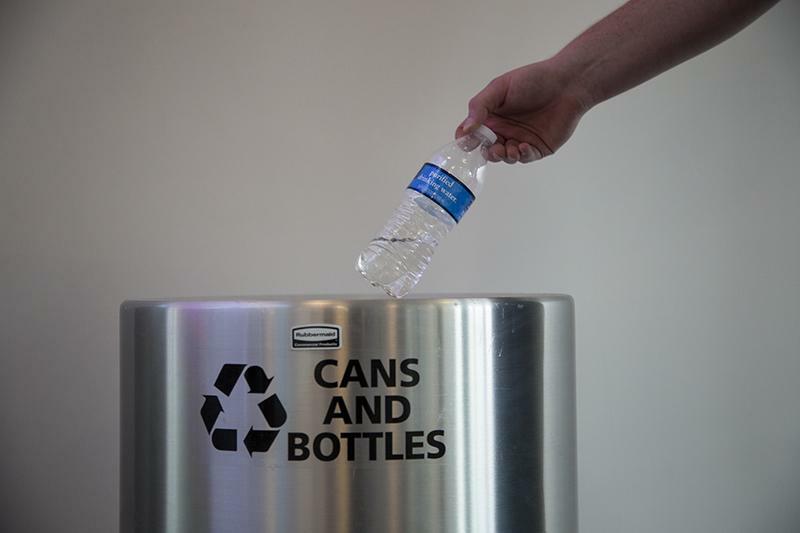 Photo by Olivia Adkins | Student recycles a plastic bottle in Griffin Hall. The first step in Wooldridge’s collection process isn’t a step for him at all, rather, it’s actually one or two extra steps toward a recycling bin for everyone else on campus. 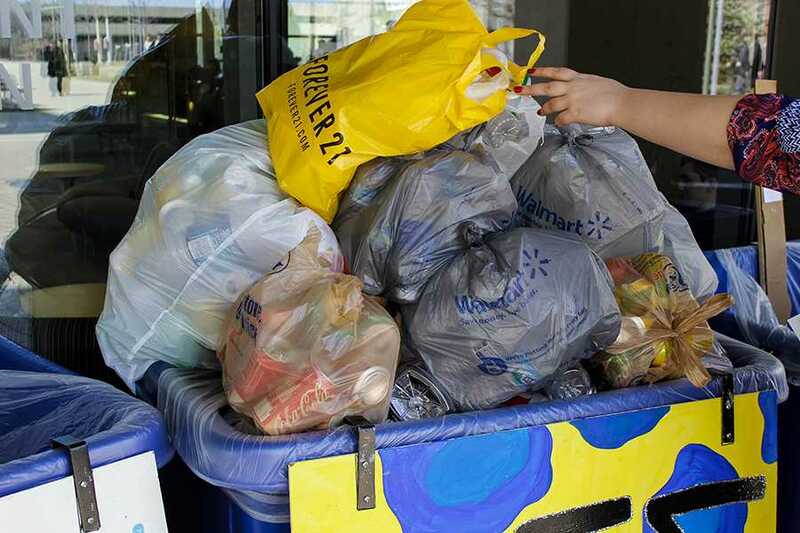 Recycling is a matter of everyone on campus taking those few extra steps past the trash receptacle and to the recycling bins, according to NKU Green Co-Director and University Planner Jane Goode. When going to dispose of an item on campus, you may opt to recycle an item in the blue, silver, white or other colored bin that sits throughout the halls and open spaces across campus. Over time, all of these bins eventually fill up and will need to be emptied. However, Wooldridge reiterated that in order for this to happen and for him to do this job, everyone else must first do theirs. Wooldridge said if people don’t dispose their waste properly, he can’t properly collect and recycle the items. He asks that all people recognize and take the time to learn what is and isn’t recyclable, and to dispose of their materials responsibly and properly. But after all the recyclable items are correctly thrown into their bins, where do they go? The next step in the recycling process is Wooldridge’s, and the rest of the material handlers’, first big task: collection. It is at this point when Wooldridge embarks on his early-morning routine. First, he clocks in and gets his morning duties from his supervisor within the Recycling Center and then he begins. Starting by grabbing a large grey recycling cart and an assortment of plastic bags, Wooldridge then makes his way into the dark tunnels underneath the campus on his way to the Student Union. Making his way past Nunn Hall and to the University Center, Wooldridge’s shadow flickers against the concrete walls of the tunnels, in tune with the squeaking of his shoes and dangling of his keys. The culmination creates an eerie and alluring scene. But what could be taken as a sarcastic remark, should be noted as a testament to the sincerity and passion that Wooldridge has and continues to put into his work at NKU. After finding his way out of a short maze of hallways, Wooldridge starts collecting the contents of each recycling bin, starting with the first floor of the Student Union and making his way up. Photo by Kody Kahle | NKU Materials Handler Chris Wooldridge on his morning routine of collecting recyclables. “I usually don’t turn on the lights, but I will today for you all,” Wooldridge said upon arrival to the first of several still-dark rooms. He made his way from bin to bin with precision and speed. Along the way, a passerby also just starting his shift yelled “What’s up?” in the tunnel. “Oh, not much, just having the time of my life, living the dream,” Wooldridge replied. Besides working as a materials handler at NKU for the past 2 years, Wooldridge has also worked at the university for 5 years and is also currently a student working his way toward a degree in organizational leadership. And with only 9 classes to go till receiving his degree, Wooldridge has no plans to leave his place of work at NKU. Regardless, as he finished collecting trash from one floor of the Student Union and went to the elevator to go to the next, Wooldridge said that NKU just keeps growing and getting better– especially as it pertains to recycling. After collecting recyclables from the 3 floors of the Student Union, Wooldridge, covered with sweat and a stern smile, headed back to the elevator in the building for the last time and started on his next step in the recycling process. Once all the recycling in one building is collected in the cart, it must be taken somewhere. This is when material handlers must make their way back to the recycling center. With a cart full of recyclables, Wooldridge returned to the recycling center the same way he came, through the underground tunnels. However, at this point things aren’t quite as desolate. Other workers have begun their shifts and could be seen walking through the tunnels, or stopped and working at certain points. Once Wooldridge arrived at the recycling center, the recyclables went to a few different places. 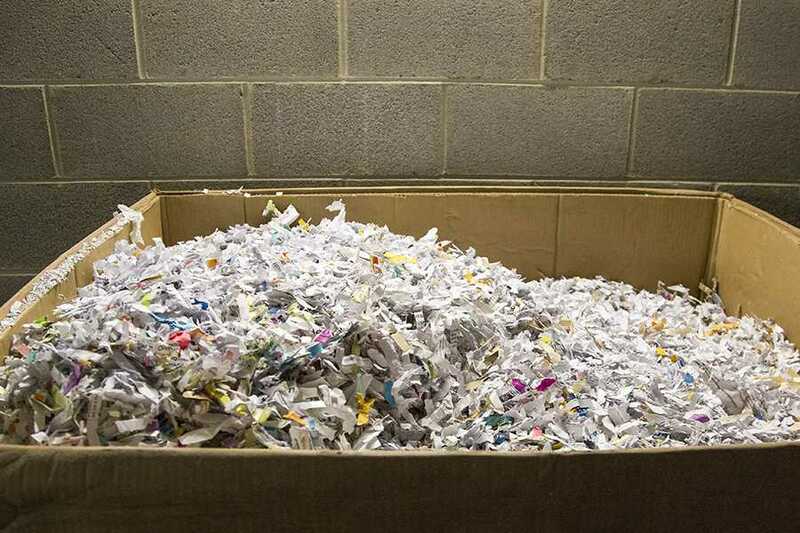 The paper materials were put into one bin and then shredded and packed tight by NKU’s very own paper shredding machine. 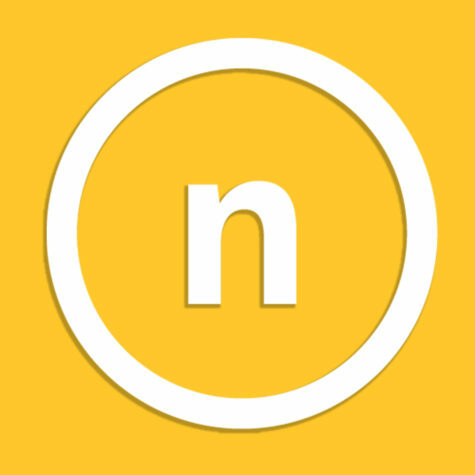 Cardboard was placed into NKU’s own cardboard baler. In the 1970s, this is something you would’ve seen two men doing by hand, according to Chuck Pettit, Superintendent of Facilities Management at NKU. Petit said these are just a few of the many investments NKU had made toward making the recycling process easier and more efficient at NKU. Other products are also separated appropriately. Plastic bottles and cans are placed in a separate area; books, magazines and newspapers are put in their own place; etc. But where do the items go from here? For the most part, it really just depends. Photo by Kody Kahle | Shredded paper sits in a bin at the Recycling Center awaiting pickup from Recycling Express. After all the items are back to the recycling center and sorted, they wait. 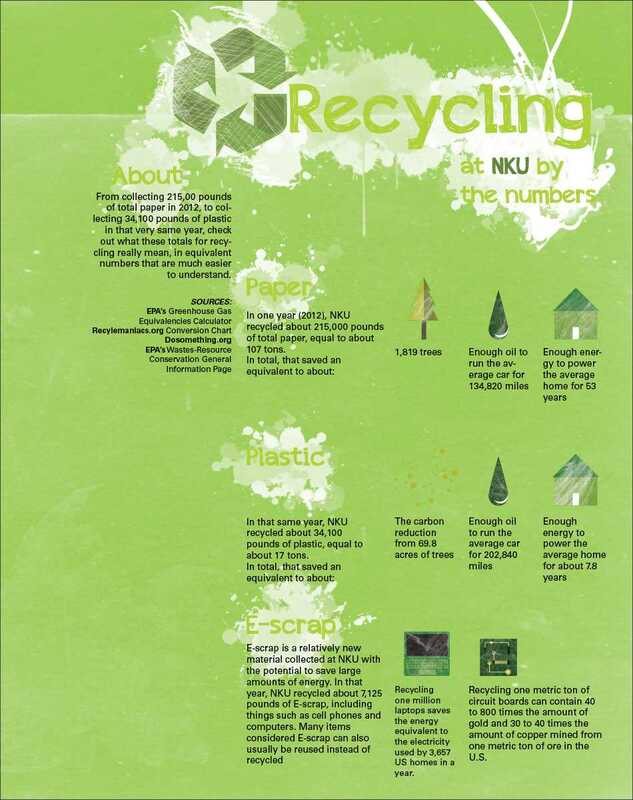 As a part of the economic side of recycling, NKU changes the outside company it uses for recycling every so often. Currently, NKU deals with Recycling Express, a company located in Florence, Ky., according to Pettit. In the past, the university has worked with other companies such as Rumpke to take care of its recycling. Wooldridge said that things such a plastic bottles and cans are taken by the team to Recycling Express in Florence, Ky.
Petit said other items are picked up. Items such as e-scrap, furniture, oil and more are dealt with on campus, on a case-by-case basis. Overall, Jane Goode, NKU Green Co-Director and University Planner, sees the behind-the-scenes world of NKU recycling as an interesting place, full of stories to be told.